Kathrine Zan is one of the country's most loved cosplayers. In conjunction with the recent release of the new Sailor Moon, Zan has appeared as Viz Media's own "Sailor Moon" cosplayer, approved by Toei, Kodansha, and Naoko Takeuchi. 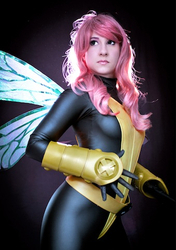 Zan has also been featured as a design expert on Marvel Method: Cosplay and produces and sells custom-designed cosplay items on her website, www.poro-poro.com.